If you’re an avid EQ2 player, it’s not uncommon to have 10 hotbars full of skills and still feel like you need more room. This is called “ability bloat” and can be challenging even if you’re only playing 1 toon. Thankfully, EQ2 has a robust in-game macro system. 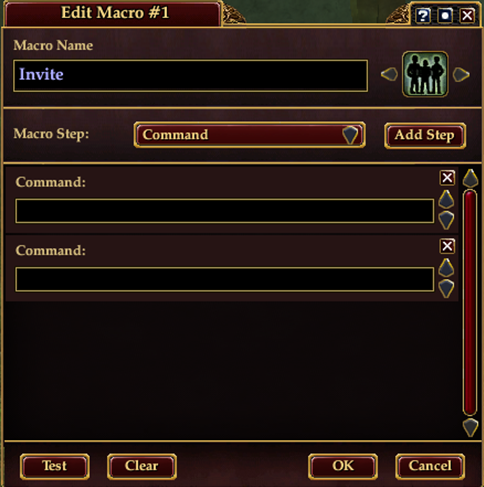 You may have played EQ2 for years and never used macros much which is ok. But when you start boxing, they can make your gaming experience infinitely easier and more enjoyable. 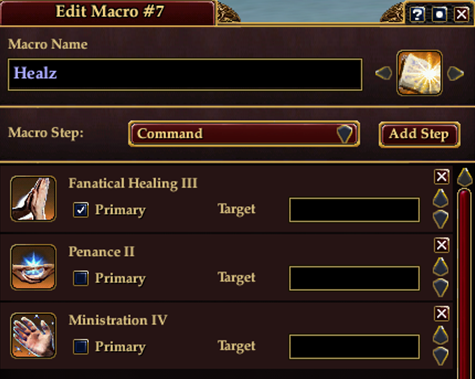 This guide will cover the EQ2 macro system and briefly how to incorporate it with ISBoxer. This is the main screen where we'll name our macro, change its icon and give it some steps. And as you see above, the 4 types of steps are a typed command, using a spell or ability, equipping an item and using an item. These should be pretty self-explanatory, so let's go ahead and create one. In this scenario, I’m going to be boxing with an example 3 man group. We’ll make it the holy trinity of MMO groups and have a tank, healer and dps class. And let’s suppose my toons’ names are tanker, healer and dpser. My main screen that I play from will be the tank. So each time I fire up the game I don’t want to waste time having to invite my healer and deeps to the group either by typing it out or clicking on them. I can do a quick macro to accomplish this. Notice we didn't need to use the slash (/) command first. If we were to type this command in our chat box to invite them, we would have to type /invite healer with the slash. But EQ2 knows this is a command since it's in a macro and doesn't need a slash first. It's optional and you can certainly put it if you want; it's just not required. Hit OK then drag this to an available slot on your main toon's hotbars. Drop your group if you're in it then click the macro in your hotbar to invite your boxing accounts to group all at once. If you watched MiRai’s video, you saw that he covered having your boxed toons “assist” your main character. This is perfectly fine to always click assist, but EQ2 makes it even easier for boxers in that your boxed toons can basically target your main character at all times. EQ2 calls this "targeting through" the main character. So in my scenario, I'm running the tank as my main character, while the healer and dpser are targeting me and auto-following me. The way it works is whichever mob I target, they have it targeted also by targeting "through" me. You can even watch their screens as you swap targets on your main toon. They will always show you as their main target, but they will also have the "implied" target displayed as well, which is whatever target you are targeting on your main character. The main point of this is, if a DPS class is targeting me and casts a hostile spell, it will hit whatever mob I have targeted. Whereas if the Healer is targeting me and casts a beneficial healing spell, it will heal me. On the same token, the healer can be casting dps spells through me, then immediately switch to healing spells without having to change targets at all. It makes it a whole heckuvalot easier this way since my boxed toons aren't having to constantly switch targets. So when I’m boxing, 99% of the time I have my other characters targeting me the whole time. When I activate this macro, it's ONLY going to cast 2 of those healing spells. In other words, you can put every single healing spell you have into one macro. But when you click it once on your hotbar, it's not going to cast every single healing spell you have. Similarly, you can throw every DPS spell in there, but one click of the macro isn't going to super-nuke the mob with all your spells firing off automatically one after the other. If you put 10 healing spells or 10 DPS spells in a macro, it's only going to actually cast 2 of them. 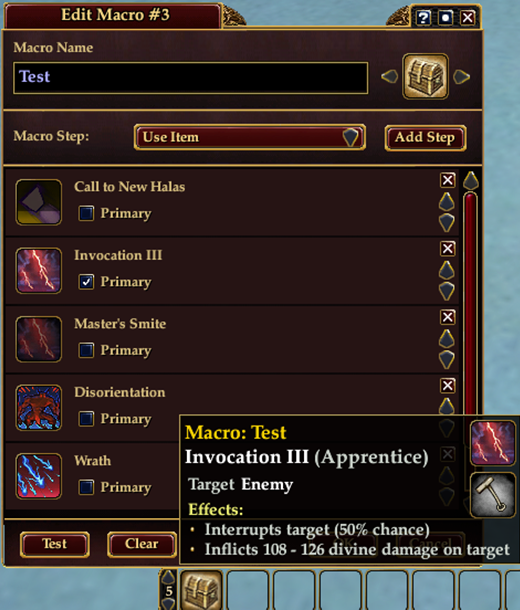 Now does this mean we need to create a ton of EQ2 macros with 2 spells each in them? Fortunately, no. EQ2 macro behavior has changed a couple of times over the years, but instead of a history lesson, I'm going to explain their mechanics in present day form (at the time of this writing). The best way to understand this is to see it in action. Get back in the game and find a mob that's blue (this way we don't one-shot him since we're going to cast a couple of spells or CAs on him, but also so he's not in danger of killing us by being an equal con fight). Create a new macro from one of your toons and open you knowledge book. Now leave this window open and click the Test button while targeting a mob. Notice how it cast the First and Last spells in your list? So in my macro it casts Distortion followed by Encase. Now press Test again and see what happens. If you pressed it while the first spell in the list was still waiting on its recast timer to expire, then EQ2 would cast the second spell in the list, followed by the last spell. 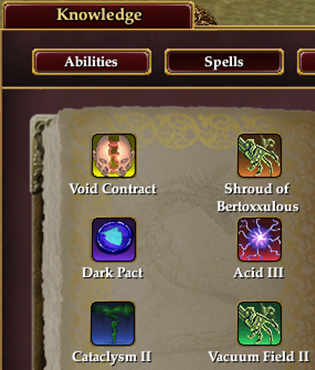 So the rule is that EQ2 will cast the first available spell in the list, but then it casts the last spell EVERY time. The “first available” spell is exactly that. It’s the first spell that meets the requirements to be cast upon the targeted mob. For instance, if you have a melee spell, but you aren’t in melee range, it will bypass that and go to the next one. If it’s a spell that only works on undead mobs, and you’re targeting a lvl 1 boar or gnoll, then it will bypass that as well. So after casting the first available spell, it will then always attempt to cast the last spell in your list every time. Notice I said attempt - if the last spell is melee and you’re out of range, it just won’t cast and nothing else will happen. Or if it doesn’t meet the requirements of the spell, then it will just stop as well. However, if the last spell in your list does meet the requirements for the targeted mob, but is on cooldown from just being cast, it will still cast it which queues the spell. Then when the recast timer expires it will fire off. Just like before, it casts Distortion first, then Encase. When I click it again, it casts Dark Pyre II since distortion isn't ready yet. It then queues up Encase since it’s on cooldown. Then after a few moments of standing there, it will fire off Encase again when it's available. So that's the mechanics of it and how it works. Now it's just a matter of placing your spells in your macro in the order you want to cast them. There are many schools of thought on this, but we'll just keep it simple. If you've played your toon for a while, you probably already have a casting order for your spells. For instance, you may cast your DOTs first (damage over time), or you may do your debuffs, or you may just like to cast your maximum impact/hardest hitting spells first. On the very first cast of this macro, spells 1 and 2 will fire. If we immediately click it again, spell 3 will cast and 2 will be queued. But instead of waiting on 2's recast, we can click it again and 4 will fire. As you see with this method, your weaker hitting spells won't cast if a more powerful one is ready. And that’s not necessarily a bad method of casting. The only issue you may run into is when your first couple of spells have short recast timers. In our example, if spells 1 and 2 have short recasts, spell 5 may never get cast in your macro. And that may be fine, after all why waste mana and casting time on a weaker DPS spell if a stronger one's ready? Then again, maybe spell 5 has some other included proc or debuff that you need and you really want it cast. Another thing to keep in mind - since we know that the last spell in your list gets cast EVERY time, it’s a good idea to place a spell here that can be used often. For instance, select a spell with a very short recast timer/cooldown, and one that can be used from a long range on any type of mob. 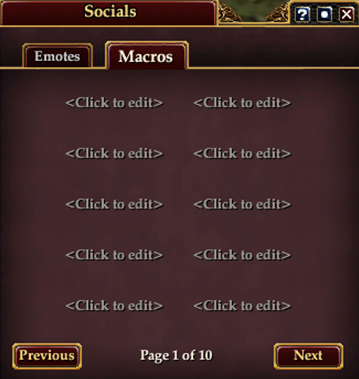 This way every time you click your macro, you’re getting the full 2 actions out of it. So that's the basic mechanics. This, like anything else, will require playing around with and testing to get the optimal setup for your toons/group. And luckily it’s very easy to change the order to test different loadouts or rotations. You can even edit a macro that’s already on your hotbar by right-clicking it and selecting “edit”. You see how we have backgrounds that are yellow, orange, purple, red, blue and green? ORANGE	spells that affect a single target - you can cast these on yourself or a group friend. And sometimes you can cast it and keep it maintained on more than one person at a time depending on how many concentration slots you have. GREEN Encounter spells - if you're fighting multiple mobs linked together in the same encounter, these spells will hit every one of them. It’s almost like an AOE but only for the linked mobs. There can be another non-linked, non-aggro’d mob in range, but he won’t be affected by this spell. So for combat, we can create DPS, AOE and Encounter macros. And in each of them, we can place the specific spells that match those categories. Then when it comes time for your boxed toons to cast their spells, you can have them cast whichever ones would be most appropriate for your current mob/mobs your fighting. I usually keep all red (single target) spells in a macro together. Then I do the same for AOEs and/or encounter spells. And of course using the same methods as DPS macros, you can create single target heals macros and group heals. We just covered your major actions and how they can be a bit limited with only being able to do 2 at once. Minor actions function a bit differently. They're not subject to the "maximum of 2" rule. Therefore you can add several action steps to them. An EQ2 macro can have a maximum of 24 action steps. And this could be in direct relation to there being exactly 24 gear/weapon/food/drink/jewelry/charm slots on your character. The important one here is equipping items and gear. As a tank I have 6 separate macros just for gear loadouts. I have one for defense for pure tanking, one for offense with more strength and DPS based gear, one with maximum run speed items outdoors, one for max run speed indoors, a harvesting loadout with max harvest stat increase items, and finally one for all my crafting gear. So you might consider one that will equip your + 25% run speed cloak that you can activate right after combat to get where you're going quicker. Then another macro will re-equip your combat gear for the next fight. Also, your major and minor actions can be combined. People will create macros that cast certain spells while including a chat command. For instance Necros typically employ a Macro that casts Lifeburn while saying in group chat "Casting Lifeburn! Please heal me!!!" Again, just create some that you need and experiment with them. If it doesn’t do what you want, try creating it a different way. Or swing by the EQ2 official or the EQ2Flames forums for some free advice. Whichever spell is checked as primary (by default it will be the first in your list) has their recast timer used as the one for the whole macro as its displayed in your hotbar. You can see here that the "Call to New Halas" spell is the primary. 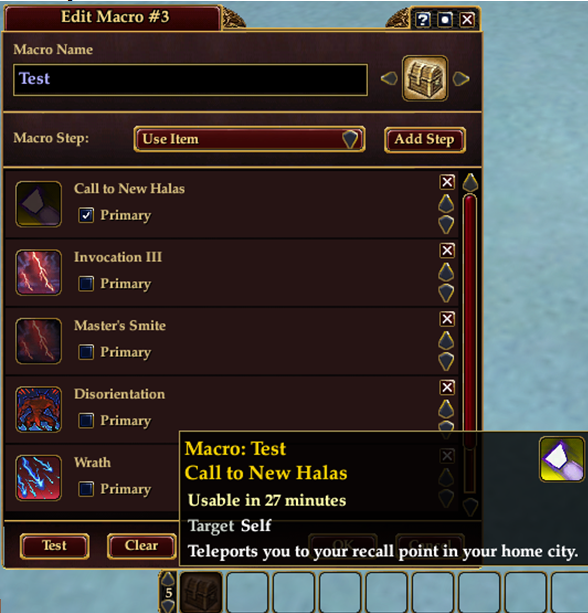 So when I hover over the macro in the hotbar, it has "Call to New Halas" as the name, and the recast time. You can also see it's dimmed in the hotbar meaning it's not ready yet, even though the other spells in this list are ready to go. Even with it being dimmed, you CAN still cast this macro. It will just pick up with the first available spell after the primary one. No real big deal here with the primary checkbox other than cosmetic. But I wanted you to know what it was in case you were wondering. When this macro is activated, the character "dpser" will ALWAYS be healed regardless of who the healer is targeting. 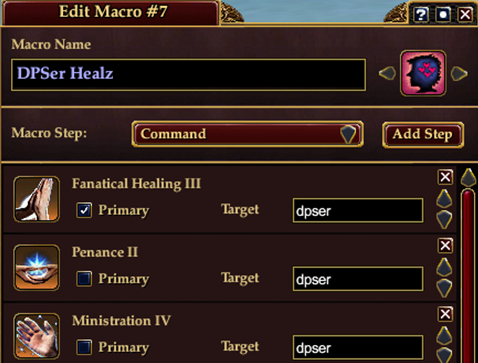 Of course you could alternatively create a macro with a "target dpser" command as the first step, and then have your heal. But after executing that macro, dpser would still be targeted. The beauty of using the "target" blank is your healer stays targeted on your main character the whole time while the spell goes to whoever you want. There is no "clean up" involved afterwards by having to get everyone reset and targeting back on your main character. Ok, so you have all your characters with single and AOE DPS macros and/or single and group based heals? Good, now we're going to incorporate it with ISBoxer. 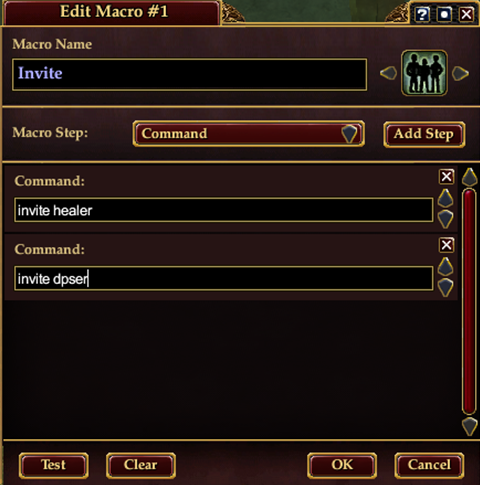 Make sure you have dragged your macros to a hotbar slot on your boxed accounts and make sure there's a corresponding keystroke in EQ2 to activate it. In other words, your primary hotbar has the default keys 1 through 0, along with "-" and "=" that you can press on your keyboard to activate the spell or macro in the hotbar. For your secondary hotbar, or hotbar 2, it's ALT+1 through ALT+0, along with ALT+- and ALT+=. And for tertiary or number 3, its CTRL+1 through CTRL+0 along with CTRL+- and CTRL+=. Your other seven hotbars don't have keystrokes bound to them by default, but you can go into your options and assign them. Or you can change any of the first three hotbar's assigned keys. Hit CTRL+O to bring up your EQ2 options, then click controls and then expand Hotbar Keys. You can scroll down the list and assign any keystroke you wish. Let’s say that you dragged your single-target macros onto your primary hotbar in the 7th slot. And let’s say that we did this on all of our boxed accounts as well. So if we press the number 7 key on the keyboard, it will activate our DPS macro - but it will only do this on our main screen. Instead we’re going to create a mapped key that will send the number 7 key to ALL of our accounts. In our newly mapped key, we’re going to add a keystroke action in the first step that will send the key combination “7” to “Window: All w/Current”. We’re also going to assign a hotkey to this, and for simplicity, you can make the hotkey the number 7 key as well. So now when you press the 7 key, it will send the 7 key to ALL of your accounts, including the main one you’re on. If everyone is targeting through your main toon, and you press the 7 key, you’re suddenly got several spells (2 from each character) coming down range to the unsuspecting mob! Impressive huh? You can also spam click the crap out of this - Instead of clicking the button once, waiting for 2 spells on each character to cast, then clicking it again, just start firing away! If one of your toons has long casting times, the spam clicking method will go ahead and have your other ones casting when they're ready. This basically ensures that there won't be any downtime in between spells. Downtime = less DPS and lower parses. Of course from here, the sky’s the limit. You’ll probably want to create a mapped key for your AOE macro as well. And you’ll also want to do one for your healing spells. Although, that one you’ll set the target as (Character Slot: 2(Healer)) or whatever the name is. If you have a full group of multiple healers and DPS classes, you can also set up your Action Target Groups at this point. And with as many hotbars and abilities that EQ2 has, I’m sure you’re no stranger to clicking around on your screen. You can add to this and set up a Click Bar in ISBoxer that will activate the mapped keys on your boxed accounts as well. That may feel more natural than pressing the “7” key on the keyboard. Hope this guide helps! Please post any questions here in the forums and I will try my best to assist you. E: 100, A: 53, S: 27, K: 20. My ISBoxer profiles for education purposes. Thanks that was helpful. One possible improvement is to add an ability like fishing to the last ability, this means that your DPS macro will only have one attack/spell cast per click, but you do not get stuck with the cool down of the last ability. Fishing simply fails when applied to a Mob. This way if you spam the DPS macro to all toons they will all be active, no cool downs. Each macro will fire on the first available ability off cool down. sgtdavebrown wrote: One possible improvement is to add an ability like fishing to the last ability, this means that your DPS macro will only have one attack/spell cast per click, but you do not get stuck with the cool down of the last ability. Fishing simply fails when applied to a Mob. This way if you spam the DPS macro to all toons they will all be active, no cool downs. Each macro will fire on the first available ability off cool down. You don't get stuck with cool downs from the last ability. Each macro will still immediately fire the first available spell/ability regardless of whether the last one is on cooldown. It's just like if you're not using macros - if you have a queued spell and you click another one, it immediately clears the queue and fires the one you just clicked. It's not like it forces you to wait. So I wouldn't say fishing/foresting/gathering/etc at the end would be an improvement, but it would be a way to only have 1 spell per click of the macro. I'm not really sure why you'd only want 1 per click on your macros though. 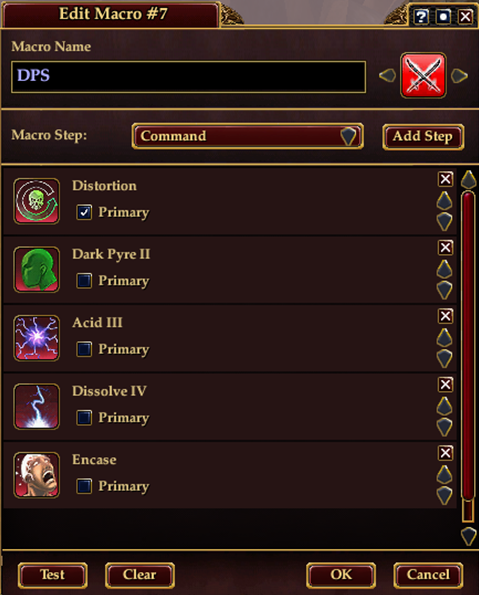 When I was boxing EQ2 I was adding command /cl to the top of each macro, this clears ability queue each time you press your macro and forces the game to use spells in the order they are listed within the macro. 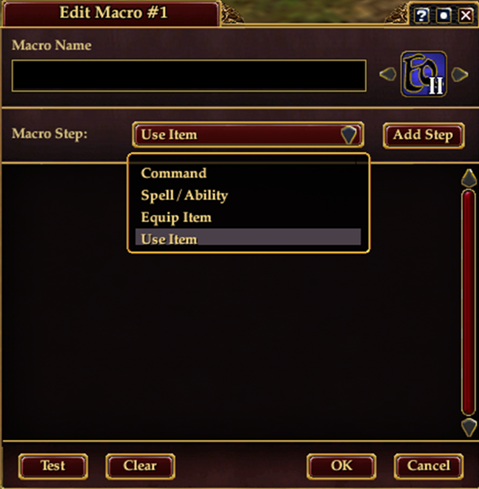 Skarling wrote: When I was boxing EQ2 I was adding command /cl to the top of each macro, this clears ability queue each time you press your macro and forces the game to use spells in the order they are listed within the macro. /cl (or /clearabilityqueue or /clearallqueuedabilities) at the top of a macro isn't doing anything. WHENEVER you click your macro, the game automatically clears your queued spells or abilities. It then proceeds down the macro and uses the spells and/or abilities in the order they are listed within the macro. You don't have to "force" it to do this because that's how it operates anyway. Now it certainly won't hurt to put /cl there either as it will perform in the exact same way with or without that command. It's just extra and unnecessary and violates the KISS rule. nexxusofa178 wrote: It's just like if you're not using macros - if you have a queued spell and you click another one, it immediately clears the queue and fires the one you just clicked. It's not like it forces you to wait. This is worth being sticky'd. It still applies and is fantastic.